The following words are as relevant now as they were when first spoken by President Kennedy: "Our labor unions are not narrow, self-seeking groups. They have raised wages, shortened hours, and provided supplemental benefits. Through collective bargaining and grievance procedures, they have brought justice and democracy to the shop floor." 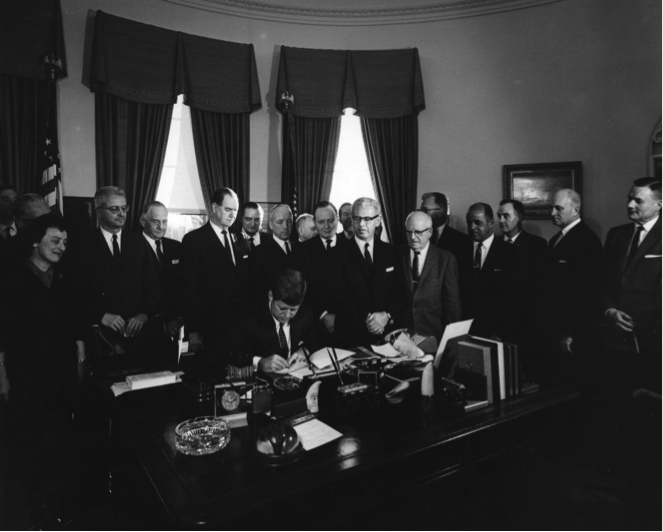 In fact, President Kennedy believed in this statement to the degree that on January 17, 1962 he signed into law Executive Order 10988, Employee-Management Cooperation in the Federal Sector! Executive Order 10988 gave Federal employees the right to join, form, or assist labor organizations! Collectively we achieve what we individually dream of. Who will identify and pursue a grievance on behalf of a worker? Are you better off on your own... or bargaining as a group? Unions pursue the common goals of all members! Equal pay, equal treatment, and equal opportunities for success are what LiUNA is all about! Please consider joining a winning team today! To join the union, please download Form 1187 below, fill out questions numbered 1 through 5, and sign Section B. Note that dues are $9 per pay period. Send your completed form to Carol Hodges at P.O. Box 15146 Kansas City, MO 64106. If you have any questions, contact Carol at 816-389-3732.